Hey y’all, the winner to our Green Guessing Game has been determined… A big congrats to Melissa for leaving the guess closest to the actual weight of plastic we recycled. Melissa guessed 5,625 pounds; we recycled 6,600 pounds. Stay tuned for our next giveaway contest! We lurve recycling plastic! Giveaway: How Much Plastic Did We Recycle? 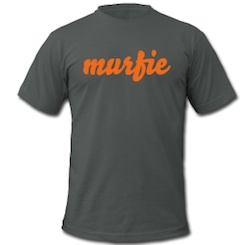 Ladies and gents, here’s your chance to bag some Murfie swag! For a chance to win a custom Murfie T-shirt and some Murfie stickers, all you gotta do is participate in our “green” guessing game! Tell us how many pounds of plastic you think we recycled by leaving a comment with your guess. Make sure your guess is in pounds, and be sure to fill in your name and email address (your email is not published). Please, one guess per email. The guess closest to the actual weight wins the swag. The next 4 closest guesses each win $5 of Murfie account credit. Now, for a hint. See the below photo for the pile of boxes we delivered to our local Waste Management facility. The Leaning Tower of Plastic measured 8 ft x 9.5 ft.
Make sure to submit your guess before midnight CST on Friday, March 30, 2012. The winners will be notified by email during the week of April 2nd. Posted on March 16, 2012 April 2, 2012 Author ashdinoCategories Promos + GiveawaysTags contest, giveaway, green, guessing, plastic, recycling28 Comments on Giveaway: How Much Plastic Did We Recycle? 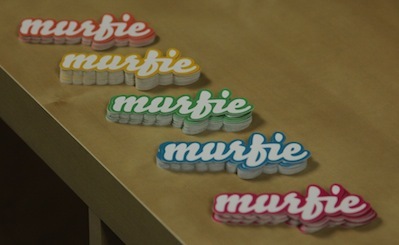 Congrats to Jeremy L for bagging the Murfie swag. He left the guess closest to the actual number of pounds of plastic we recycled. Jeremy guessed 5,555.5 pounds; we recycled 6,024 pounds. In sharp contrast to my typical devil-may-care ‘tude (“Dream on, Ashley”), I’m gonna get a little heavy here. The world’s got >99 problems. There’s no way around it. Sustainable development, climate change, poverty, species extinction, energy security…the swarm of social, political, economic, and environmental issues can get a little overwhelming. What’s more distressing is the feeling that we are powerless to do anything, that individual action would be ineffectual, that no one is actually capable of making a meaningful difference. That’s a little scary. But you know what? I don’t think that’s an accurate representation of our capability and willingness to force change. I mean, nobody can do everything, BUT everyone can do something. And small steps can make great strides. “If you think you’re too small to be effective, you have never been in bed with a mosquito” (Betty Reese). 1) Recycle, including old electronics (no explanation needed). 2) Buy in bulk to reduce the amount of packaging waste. 3) Unplug electronics when you’re not using them to kill standby/phantom power. 4) Use reusable drinking containers, instead of disposable coffee cups and plastic water bottles. 5) Turn off the lights when you leave a room to reduce energy use. 6) Don’t take 10 minute showers – consider cutting your shower short by a few minutes to conserve water. 7) Lower your home thermostats, including water heater, to conserve energy. 8) Buy energy efficient compact fluorescent light bulbs to save energy. 9) Use a reusable rag or towel, instead of napkins and paper towels. 10) Use reusable lunch bags and shopping bags to cut down on paper and plastic. Posted on June 6, 2011 July 21, 2011 Author ashdinoCategories Green + DeclutterTags eco-friendly, green, planet, tipsLeave a comment on Overwhelmed by 99 probs? Here at Murfie HQ, we try to do the right, and cool, thing. In the Murfieland context, that means providing an awesome service for buying, selling, and trading music, AND recycling plastic CD packaging. Murfie isn’t into this whole plastics recycling thing because we are all (light/dark/bright) green-eyed, bleeding-heart liberal monsters…we recycle because it’s the right thing to do for your music experience as well as U.S. municipal solid waste (MSW) management. According to the U.S. Environmental Protection Agency, over half of MSW (54.3%) is discarded into landfills, and 11.9% is burned at combustion facilities. No matter the shade of your environmental eyes, that’s pretty icky for our planet. What sort of trash are we disposing in landfills or burning?…well, along with paper, metals, yard trimmings, and glass (etc. ), plastics make up 12.3% of total municipal solid waste generation. And guess what? Only 7 percent of that plastic waste is recovered for recycling. A 7% recycling rate is pretty darn low. Too low, actually. The only right thing to do is up that rate. That’s why Murfie makes it our business to always separate out and recycle the plastics that comprise CD packaging. This ends up being a pretty big job, as we accumulate tons and tons of boxes chock full of jewel cases. But because Murfie can make anything awesome, we had a bit of fun and put together a time-lapse video depicting what an epic chore unloading plastic CD stuff can be. Check it out! P.S. If you want to know more about that whole plastics recycling thing (and much, much more! ), the EPA has put out a great facts and figures report on MSW generation, recycling, and disposal. Posted on February 7, 2011 September 14, 2011 Author ashdinoCategories Green + DeclutterTags green, plastics, recycling, time-lapseLeave a comment on Sayonara, plastic CD packaging!